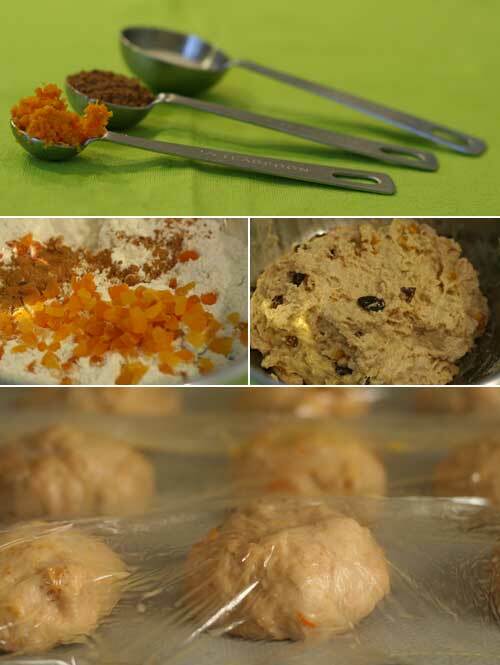 Alchemy in the Kitchen: Hot Cross Buns – and an Invitation to Commit Gluttony! 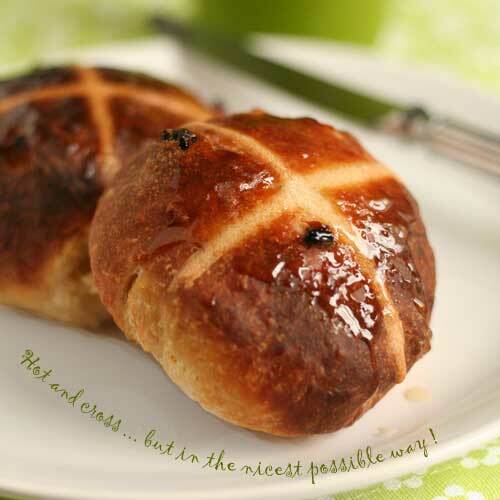 Hot Cross Buns – and an Invitation to Commit Gluttony! 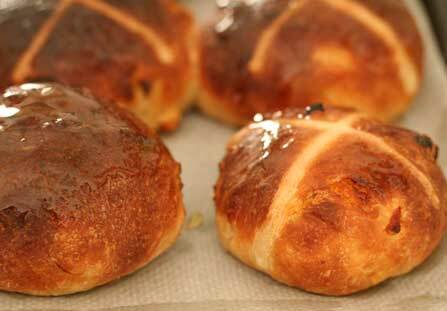 Hot Cross Buns are traditionally eaten on Good Friday. These ones will lead you into temptation. As a child, one of the great treats of staying with my Gran in Cork City was that her local bakery produced great Hot Cross Buns at Easter. Maybe my taste buds are suffering from nostalgia, but I haven’t been able to find a bakery since that can produce a bun of comparable deliciousness. Many commercial versions taste like a mouthful of sawdust – a penance indeed. 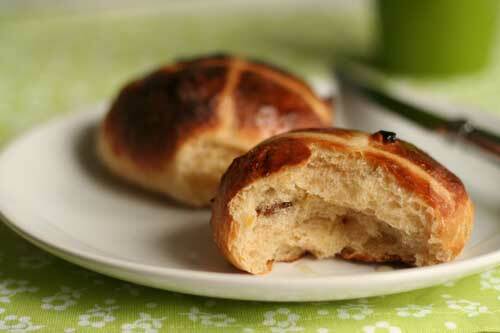 Experience has taught me that these Easter buns are a creation often best baked at home. Easter is thought to be named after the Anglo-Saxon goddess of Spring, Eastre, and some believe this sweet spiced bread was baked in her honour. It makes much more sense to me that these sticky treats are a celebration of springtime and abundance to come rather than an invitation to commit Gluttony in the dying days of Lent. Whatever you believe, they are delicious. One tablespoon runny honey, warmed (I put it in a heatproof bowl and stand the bowl in hot water). Put the flour, salt, ground cinnamon, orange zest, dried yeast, olive oil, dried apricots and sultanas into a large bowl. Mix to combine. *Weigh the honey directly into a small saucepan and add the milk. Warm the milk to between 27°C - 35°C (this is when a finger dipped in the milk will feel neither hot nor cold – but best to use a thermometer). After the dough has risen, turn it out onto a lightly oiled work surface, and knock it back. (This simply means giving it a couple of jabs with your fists to remove most of the air so you can form it into its final shape.) Knead lightly for a minute or so, before dividing into 12 equal portions. Roll each portion into a ball on the oiled surface, and flatten slightly into a bun shape. Line a baking tray with non-stick baking parchment and gently transfer the buns to the tray. Cover the buns with lightly oiled cling film and leave in a warm place, until once again doubled in size. Make sure the buns have plenty of room to rise. Meanwhile, make the paste for the cross by mixing together the flour and water - you want a smooth paste with a consistency similar to porridge. When the dough has once more doubled in size, remove the cling film. 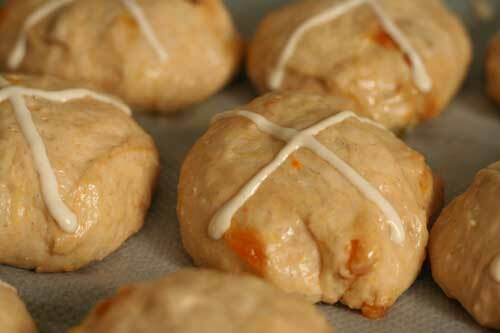 Carefully pipe the cross shape onto each bun. Transfer to the pre-heated oven and bake for 10 – 12 minutes or until golden brown. Transfer the buns to a cooling rack and immediately brush them with warmed honey. It is considered good luck to share these buns and the cinnamon and orange make them particularly good with coffee so what better excuse to invite some friends over! Lead me not into temptation... well, perhaps just the once! This recipe was first published in April 2012 and is back by popular demand! Oh yummers! It's time again for these lovelies! Seeing so many lately, I'm getting cross-eyed ..... in a good way :) I accept the invitation! Those look great! I love your title, heehee. I hardly ever see these at bakeries anymore. Not sure why because they are a classic favorite to me. The only solution to that issue is to bake some of my own. Yours turned out beautifully and I love that fluffy texture as shown in your picture. Well done! I’ve never had hot cross buns, since I didn’t grow up here. Sounds like a delicious treat! Those look delicious, and I think the honey glaze looks perfect. As someone who starts observing Passover in a couple of days, such gorgeous carbs make me want to weep. I'll take you up on that invitation! These are just perfect and classic. Lovely photos! I'm always very proud to say that homemade hot cross buns are always the freshest and best! Yours look superb! Oh, I love this method for forming the cross! Beautifully done...and I know they must be scrumptious! I love hot cross buns :) I really do need to get on it and make a batch. Side note - are sultanas, raisins? The crosses on these look ever so much more appealing the the sickly sweet icing I see on most bakery varieties. And the glaze! Temptation indeed! Thank you for sharing! Oh this is amazing. I need these in my life immediately. These cross buns are simply gorgeous. These are gorgeous! Way more tempting than what I've been seeing in the stores lately!! I love how those buns look with the cross baked right in. Such great flavors, too!!! Hot. Cross. BUNS! NOM!!!!!!!!!!!!!!!!!!!! :D I hope you had a joyous Easter! These buns look great, both inside and outside. Fabulous pictures too! I adore hot cross buns. Yours look beautiful! I'm the only one in my house that will eat them though...if I make these, I'd have to eat them all myself! These buns look absolutely perfect! You make it sound so easy, Hester! I accept your kind invitation! Your hot cross buns are perfect! Some day I will bake a batch for my family--but I'll have to leave out all the good stuff. Sigh. Oh Hester...these are beautiful! I like your no knead attitude! And I love that drizzle of orange blossom honey. Very very tempting indeed! Sorry I'm so late in commenting about your hot cross buns, I can imagine how good they are.